Believe it or not, Edwardes Lake was something of a boating destination back in the day. Formerly home to the Preston Yacht Club, the lake once boasted a traditional weatherboard boat shed, and was quite the locale for tacking about and stealing kisses of an afternoon. The original boat shed somewhat unsurprisingly "burnt down" in the 1970's. Shortly thereafter it was faithfully rebuilt in the preferred medium of the day: chocolate brick. 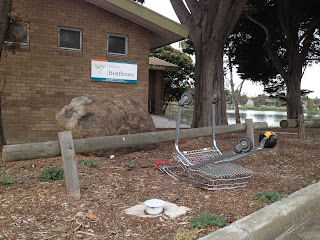 For some reason Edwardes Lake never regained its former status as a boating destination from that point; some blame the flashy choice of linoleum in the interior, others blame the rising heavy metal and toxic algae counts in the lake. Either way it's a shame. As a local councillor said recently: "Why can't we offer the same sort of recreational opportunities as Albert Park Lake, like boating? Why can't residents in the northern suburbs have a thriving lake?" Probably because they'd have trouble shutting down the weekend trolley derby in the car park. And of course there's the toxic water thing. People are funny about that. With thanks to C for the evocative image. Oh! Great post you have shared, I must say this is very informative.Thanks for sharing this beautiful post.